Lutum is reclaimed for the Golden Throne, the heresies of Nadoun and his lackeys put to the torch - but all is not well. The Inquisition has traced the cause of rebellion to the nearby Ioria system and worse still to meddling xenos. Mustering the forces of the Imperial Guard once more they are tasked with cleansing Ioria of the alien taint no matter the cost to the planet and its long forgotten inhabitants. The sins of heresy. The taint of xenos. A mystery that must be unveiled. Will your regiment answer the call? Is your Inquisitor ready to put themselves into the most dangerous of investigations? Welcome comrades and Inquisitors to the second barracks Campaigns! As with the Assault on Lutum Campaign this will be a series of challenges in the same way - please read on to find out more and as ever if you have any questions let us know. Each Campaign has three phases in the form of three modelling and painting challenges in succession, each running for a month. Once you have pledged to the Campaign you may participate in as many of the phases as you like in any order - there are no prerequisites, you can make a vow even if you failed previous ones. Cleansing of Ioria has the Inquisition as a special guest, so will work slightly differently to Assault on Lutum. You may vow for both factions concurrently if you wish (so for a total of up to six vows, if you so choose) as they work independently of each other for the Campaign's processes. Your regiment's official name, along with any nicknames they may have. This is the commander of your regiment's contributing forces. It doesn't have to be the regiment's overall commander, or your avatar - could be a character you make up (or model...) for this particular Campaign. Perhaps he might also lead your forces in future Campaigns..? Your Inquisitor's conclave/warband/cell/etc name, if it has one. Alternatively this could just be the Ordo they belong to. This is the Inquisitor at the head of your investigation, in the same way as the Guard has a commander. How is the regiment built? How does it make war in His name? For Inquisition vows, what type of servants does your Inquisitor have at his disposal, and how does he like to use them? Each phase must be vowed for as it comes in the same way you would normally - each vow is a single unit. Once officially vowed you are taking part in that phase but must re-vow later if you want to do the following ones. There is no cut off date save for the final deadline, you may vow for any phase during its run. Each phase shares the same primary rule of which you will be familiar: Guard models only from any Guard publication using GW, FW, counts as or kit bashing. For clarity; any traitor forces vowed will be "represented" as loyal (if perhaps ramshackle and dubious...) elements of Imperial forces for the purposes of the overall narrative. Your official vow requires a WIP shot of the model(s)/bits which may be primed ready for painting as well as the total Points value from the appropriate publication you are vowing from. Your vow is only finished when you post a finished vow image stating your vow is complete. Note that only the model(s) are part of a vow, the backstory part is done when pledging to the Campaign but you are more than welcome to add some fluff to each of your vows. As you might expect we don't have the time to write small novels, instead there will be a variety of pieces written in potentially different ways - on the fate of the Campaign and planet and a piece on each regiment and warband's participation. We're not planning on writing your army background nor killing everyone off, so whether the Campaign's results make their way into your regiment's or Inquisitor's official background is entirely up to you. Of course you can't have a Campaign without shiny trinkets right? Everyone who participated will get a sig image, they will be customised to represent your successes and participation in each phase. The Lord Commander will get their own customisation to represent their status as the leader, as will the Inquisitor in charge of the Holy Ordos of the Inquisition on Ioria. Please note that for consistency the award levels remain at one to three successful vows only (leader status aside), so there are no special bonuses for completing more other than knowing you went above and beyond in the name of duty! Q: How do I become the Lord (or Lady) Commander of the Campaign? A: Vow and complete more Points than anyone else! Remember only one vow per phase and one unit per vow, so choose wisely... The bonus value for appropriate FOC choices is currently classified information. In the unlikely event two (or more) vow totals are the same we will let the Dice Gods decide. Q: How do I become the Inquisitor of the Campaign? Q: How does the Inquisition Warband Formation work? A: It works as a single unit entry, in the same way as a normal army choice. So you may pledge various elements of it (using the subset clause) if you wish, but it counts as no FOC element. Please note that non-Inquisition elements such as the Adepta Sororitas units for example are not valid for this Campaign. Q: Will my regiment be destroyed/commander/Inquisitor killed? Q: What level of detail will there be in the write ups? A: We're not going to be writing lots, but they will be a direct reflection of your vows and we can make use of whatever background you give us. Succeed and your pledged forces will too. Vow lots of tanks and they will roll into battle upon them for example - but that also means they will fail with you... Their fate is in your hands don't let them, the commissariat or the Emperor down! If you have any questions please let us know! Ioria must be saved from the clutches of foul xenos, and whatever is there must be snatched from their cold, dead hands if necessary! Edited by WarriorFish, 30 January 2017 - 01:14 PM. I, [MEMBER], hereby pledge the forces of [REGIMENT/WARBAND/ORDO] under [COMMANDER/INQUISITOR] to the capture of Ioria in the name of the Emperor. The contribution of [UNIT] at [POINTS] will do their duty no matter the cost. The phase begins immediately, and vows may be made at any time during the phase's run. Phase 1 will end at 2100 GMT/B&C time on Sunday the 5th of February, make sure your vow is done by then! Edited by WarriorFish, 28 February 2017 - 08:48 PM. I,Sete, hereby pledge the forces of Ordo Xenos under Inquisitor Sebastos to the capture of Ioria in the name of the Emperor. The contribution of an Ordo Xeno Inquisitor at 38 points will do their duty no matter the cost. By 'Inquisitorial forces' we understand forces that are in fluff formed by Inquisition (such as Death Watch), that have Inquisitorial faction in Codex:IA (as you can grant it to some units using formations), or only these that are in Inquisition part of C:IA? I ask, because small nitpick here - if you bar Sororitas from Inquisition warband, like above, you also bar things like Arcoflagellants, Crusaders or DCA as they are now Sister units too, in fact in the most recent book only purely Inquisitorial unit is common 4 pts gun acolyte, sadly. Should I be using Codex:Inquisition, Codex:Imperial Agents, either? Can I use a formation outside of this, such as an Assassin from Officio Assassinorum? Is this thread for pledging to the campaign or just phase 1 with wip pics or both? I, tvih, hereby pledge the forces of Vostroya and the Steel Legion under Commander Goriev to the capture of Ioria in the name of the Emperor. The contribution of Veteran Squad at 121 points will do their duty no matter the cost. I, Mard, hereby pledge the forces of the Valkyrian 7th Regiment under Colonel Eleanor Varrot to the capture of Ioria in the name of the Emperor. The contribution of the following forces will do their duty no matter the cost. So I'm doing something a little bit different for this years campaign and will be painting an Epic army. I'll match each phase's FOC chart as closely to the formation I'll be choosing for this army but I'll be out for the running for Lord commander. All troops in the regiments from this world and vassal worlds are selected via lottery: Selection by the God-Emperor's grace, and a little luck. The armies are made up of average or above-average citizens recruited from all levels of society at the age of 15. Based on the Cadian use of "White Shield Regiments" young cadets are put through their first battles in these units before moving on to more specialized formations such as Shock Troopers, Air borne assault units, artillery and tank companies. In larger campaigns the Valkyrian forces are known to make use of the rare Leviathan mobile command center to coordinated the vast numbers of men and vehicles found in Valkyrian Regiments. The regiment often makes use of trainees from the Scholastia Psykana as well as allies from the Tiatan Legio Crucius from the nearby forge of Ryza. Drafted over 22 years ago Eleanor Varrot joined Valkyrian white shields after winning the lottery at age 15. Her work ethic quickly saw her promoted after a grueling 3 years and she was soon selected for officer training after pulling her fellow cadets out of several tight positions after heinous casualties were suffered amongst the officers during the war for Helbecht's reach. During her officer training Eleanor served tours of duty with most aspects of the Valkyrian armed forces to get a feel for how each company operates, spending most of her time on campaign as a sniper for the Karskin and Grenadier formations. Now she is one of the most feared yet respected officers in the Valkyrian military with a string of campaigns under her belt able to command the combined armed formations of the Valkyrian 7th Regiment from her Command Leviathan Graf Eisen. Edited by Mard, 05 January 2017 - 10:32 PM. I, HLVW, hereby pledge the forces of The 121st Dark Star Regiment under Major Ezekiel Cross to the capture of Ioria in the name of the Emperor. The contribution of 1x Vulture with punisher cannons at 155 points will do their duty no matter the cost. - Major Cross like all Elysians enlisted at the age of 18. He was quickly elevated in the NCO ranks and was later referred by his company commander to attend Officer Candidate School (OCS). After graduating OCS 2 years later, he went on to command his first platoon and later went through selection to join the Elysian storm troops. After having served 7 years as a captain with storm troops he was promoted to Major and given command of a Company in the 121st Dark Star Regiment where he still commands today. Deployment Orders: After the successful missions completed by Captain West during the Lutum crusade, Field Marshal Janus Croft desired that his troops play a larger role in upcoming assault of Ioria. Again being granted permission by the Marshal of the Nemesis crusade, the Field Marshal dispatched Major Cross with a larger force than before to participate in the Regiments glory along side other units of the guard. He was instructed to complete his mission no matter the cost but to also keep a close eye in the shadows to not be surprised by the Inquisition. If it is permitted, I would like to vow one more vulture and 2 Taurus for this phase. Edited by HLVW, 03 January 2017 - 02:27 AM. I, Honda, hereby pledge the forces of COHORT:110011 under Magos Dominus Artikus-110011 to the scouring of Ioria for the glory of the Almighty Omnissiah. The contribution of Magos Dominus at 148 pts [POINTS] is calculated to produce a 73.0954% chance of success. Additional resources will be assigned to increase the COHORT:110011 effectiveness as threats emerge. Equipment: Power armor, Power Axe, Conversion Beamer, Ulmeathi Plasma Siphon, Rad grenades, Digital weapons, Tome of Vethnor. Note: My Inquisitorial warband identifies with the Ordo Xenos, but will use Mechanicus models to represent the various parts of his retinue. EDIT: Corrected Points and equipment. Magos now carries a Power Axe. Changed name, because reasons. Edited by Honda, 08 January 2017 - 01:45 AM. I, brettfp, hereby pledge the forces of 42nd Savlar Chem Dogs under Captain 'Slip' Saveryx to the capture of Ioria in the name of the Emperor (and definitely not just to steal stuff). The contribution of 1 Infantry Platoon Squad at 65 points will do their 'duty' no matter the cost. As this is the start of my army, I only have a rough idea of some backstory, but I'm still writing it. This should be a fun way to get back into the hobby after years away from it. Edited by brettfp, 03 January 2017 - 07:15 AM. Salamander's Chapter of Space marines. originally a form of experiment, Capitan Agatone petitioned Chapter master Tu'Shan to allow him to collect guardsman and units from the survivors of destroyed or nearly destroyed regiments or task forces. Eventually a near full regiment was garrisoned on Nocturne away from the prying eyes of the high lords of terra and has served in the same way that the Salamanders treat their fleets and other battle equipment, ad hoc and brought together and equiped to defeat whatever threat the Salamanders need them for. Each squad in the sentinels use to belong to some other regiment of the Astra Militarum, but due to severe battle losses or simply doing so well as to draw Agatone's attention, they were recruited and given the option to be more. To earn the honor of being brought into the Sentinels, a guardsman, unit, or tank crew must show an unflinching loyalty to the Imperium, they must be unyeilding before the enemy, and they usually have been seen placing themselves between a foe and civilian forces. These are traits no different than the Salamander's themselves eschew, and over time has built the Salamanders a personal guard regiment that is generally used when the full might of the Space Marines is un-needed, but when actual intervention by Astra Militarum forces would lead to (what the Slamanders would deem) too many civilian casualties. Many times a garrison of Sentinels will be brought along and left behind by the Salamanders once they've accomplished a goal, with the understanding that they would help rebuild, protect, and maintain civility once the Space Marines have left. Generally these missions don't last very long and then the Sentinels move on to a new location. As with the Chapter's equipment, the Sentinels are required to upkeep their own gear, and maintain their own vehicles. While a small number of Techpriests resides along side the garrison, they are less required than in any normal guard unit. Some Techpriest see this as heresy, while others, and the Salamander's own Techmarines see this as benificial. Furthermore the Garrison includes far more vehicles, special weapons,and better armor than most Astra Militarum units are use to seeing. Recently Brother Argos - Salamander's master of the forge, has negotiated both the Knight Lann Tiarna, as well as the Warhound Traitor's Pyre,to both join the garrison forces of the Sentinels. Recent questioning, and noted documentation from internal sources show that the Sentinels have come under the gaze of both the high lords and the inquisition due to the nature that they've remained apart from any formal Astra Militarum leadership and do not answer to the Leaders of Humanity, but instead take orders from an Adeptus Astartes Chapter. "The 1st Firestorm Sentinels were under direct orders to secure the 11th Hive as a staging ground for the Salamander's 3rd Company2nd Squad's investigation of Xenos activity. However once the Dark Eldar attacked they were left to defend the hive while my brothers delt with the threat. Their actions and response were consummate with their instructions from Seargent X'antar and as such, I have asked that your request be denied, and that you be barred from further action against the Sentinels"
Addendum from Inquisitor Shadryn reguarding the dissapearance of the 7th Kolburn Dragoons (Ordo Xenos): My inspections initally brought to light, that while the majority of the dragoons that were sent to the planet known as the Black Islands were destroyed during the Genestealer uprising there, it was found that veteran units and a single hellhound crew survived for nearly 6 months while conducting hit and run as well as sabotage raids against the vile forces that took the planet. When the Emperors might decended upon the Black Isles and the planet was cleansed by the concerted effords of no less than 3 Regiments of the Imperial Guard, as well as 4 squads of the Salamander's legion, those remnants of the Dragoons that I had heard rumors of and who had actually contacted us with information on the planets fall, were no longer found on the planet. A grainy vid pic taken from one of my servitors on overwatch near the spaceport that was commandeered by the XVIII legion showed a hellhound being loaded into a thunderhawk. Later investigations and a visit to Nocturne turned up no records intitally of the missing units, of which I personally wanted to question. On further investigation, one of my loyal agents posing as a trader sent me a much clearer pic of a hellhound group on Nocturne, the lead unit sporting faded but recongnizable iconography from the remains of the 7th. Further questioning into where this hellhound and possibly the two units of mounted veterans have gone. To date I have found nothing other than hearsay. I shall continue my search. Addendum from Lord Inqusitor Hellos (Ordo Maellus) \\Cross Referenced file\\: I have seen an oddity today. Here on the Forgeworld of Barracus, a cult that split off from the Adeptus Mechanicus, managed to summon a portal into the demonic realms which spat out the daemonic entities known to reside there. These foul and unholy creatures latched onto the machines prepared for them through unholy rites and came to life immediatly. I was ill prepared to deal with this form of threat, having no weapons capable of harming the ceramite armour that encased them. However from the shadows strode a single Space marine, wearing the colors of the XVIII legion. He turned to a Guardsman Captain behind him and told him simply "overwatch duties", and hefting a hammer, set about laying low each daemon engine before us. Once their shells were broken I was able to banish the entities back to the warp and potentially preserve the entire Foreworld from what could have become a major incursion. During the battle, the Cult members had escaped during the meele and I was preparing to settle in for a very long investigation. However this Astartes who's name is ||redacted|| simply waved me to follow. Lead to a secured room, void dampened, was the 4 cult members I had seen, and another 36 that had been rounded up by the guardsmen. I had each Guardsmen tested for corruption, and found them to be more stalwart than some of our own stormtroopers. Further research has led me to the name of these Guard as the "Forgeguard". However the Forgeworld has no guardsmen units by that designation. I will investigate Further. Drake's Claws - Name given to seigebreakers, Air Support, Fleet, and anti-air units. Forgeguard - Name used for task force elements directly tied to defending technological artifacts, forgeworlds, and high value targets involved in any Adeptus Mechanicus endevors. Under no circumstance should this regiment's equipment be taken at face value. Though seemingly weathered and beaten, it is painted and built this way to throw off their enemies. None would susupect that their gear is a higher quality than normally found by the average guard unit due to it's appearance. Commander Shade hails from Amarah Prime, a world that no longer exists in the Imperium thanks to the Necrons. Having joined the Guard intially a basic infantry lineman he showed a meteoric rise through the ranks, eventually coming to command the 4th Armored company of the 607th Callain Manticores. However disaster struck his regiment while fighting a corrupt Planetary Govenor and to nearly a man they were wiped out. Only when the Salamanders responded to their distress calls, and brought their own righeous fury to the planet did Edric see revenge for his lost comrades. During the entire campaign, Edric belived that the average citizen had no real clue what was happening, and once the fighting broke out he ordered his 12 Armored Fist squads to defend the Hab Blocs on the southern part of the capitol. When Captain Agatone found the seeming wreck of the Baneblade that Edric was commanding from, he originally passed it by, however when an ambush of fanatics loyal to the Govenor attacked, all armed with suicide style melta bomb devices, did Agatone realize the baneblade wasn't fully wrecked. Having hauled himself into the Heavy bolter sponson, Edric mowed down the attackers before they could catch the small squad of marines in their blast radius of melta bombs. Agatone found the (then Captain) Severly wounded inside the Baneblade, Severe Burns, a missing arm, and practiacally blind from the explosion that gutted his baneblade. On review of his command files, and in light of his actions, Agatone decided to have him brought into the 1st Firestorm Sentinels, where he continued to rise through the ranks and display an unwaivering sense that the Guard are to defend humanity, even from itself. there's usually always a large amount of armour involved as well if he can help it. "Why hate the Tau who only fights to defend his home? The Eldar who are scattered, and only seek to survive? The Ork, who is too stupid to know better? Remember,hate the Human that has turned his back on the Emperor, and on humankind as a whole. For they are the true enemy of humanity, they who would sacrifice their own brothers for power, or greed." "Let me tell you something Inquisitor Bellac. Our orders were to protect the populace. We did that, even from you. We'd do it again. I lost six hundred men to those Dark Eldar raiders, six hundred who died knowing that their blood would buy time and freedom for that Hive, and it did. You cannot brand us traitors for we have betrayed nothing. We, as always, will stand in front of those who would do harm to the loyal citizens of the Imperium." pending approval by Commander Shade. After the events at the forgeworld of Barracus, Hellos sank his teeth into finding the Forgeguard unit that did his job for him. Finally tracking down the Valkyrie that carried them off planet due to it's unique orange striping a weathered appearance. Now he has attached himself to the Regiment after time and again they have proven equal to any task he has requested of them, and furthermore even in the face of the Daemon, they will not abandon a location if even one civilian could be saved. Edited by GKTerminator, 03 January 2017 - 10:20 AM. It's better to paint at your own pace, and love what you've done, than regret it later because you rushed. Instagram: theanvil86 // Large Deathguard Chaos army for sale or trade. PM me if interested. STILL FOR SALE!!!! The rules of the Campaign are not defined by the fluff, so the likes of Crusaders etc are all applicable as Inquisition units. Sisters, Death Watch and Grey Knights are all strongly tied to their own identities more than the Inquisition directly, so they're not featured in this Campaign. You can use either codex, just specify if there's a points difference. Formations are ok, but they need to contain at least one Inquisition or Guard element to be valid as you can only pledge them - so no Officio Assassinorum models. I, Mard, hereby pledge the forces of the Valkyrian 7th Regiment under Colonel Eleanor Varrot to the capture of Ioria in the name of the Emperor. The contribution of 2 Sentinel squadrons and 1 Hellhound platoon will do their duty no matter the cost. Good to see you participating, even if you can't put any points forward - but don't forget your vows still count towards the victory total so be sure to complete! It's a single unit only, so you can do a second Vulture if they can be taken as a squadron (or formation). The Taurus will need to wait for another Phase, or you can add them in as bonuses that won't count towards your points - but will towards your completion. Edited by WarriorFish, 03 January 2017 - 12:19 PM. I have a question, If I pledged to complete my Inquisitor this phase (as a HQ choice), and decided to complete the Warband formation from C:IA in a following phase, would I have to make another Inquisitor, or could I include the existing one as part of the formation to make it legal (without getting any benefit from his points cost for the second time)? Edited by Beaky Brigade, 03 January 2017 - 11:59 AM. You can make a vow of subsets of an entity, so it is possible to make a Warband vow without an Inquisitor in the same way as you can vow only an Infantry Squad from a Platoon - it wouldn't be the same Warband by the rules of the Campaign but this doesn't make a difference The requirement is always whole units, with the exception of upgrade characters, as this is what their point value is calculated on also. I, Ubique, hereby pledge the forces of the Terran Vigils of the Militarum Tempestus under Commisar Carlos Vokes to the capture of Ioria in the name of the Emperor. The contribution of a Taurox Prime "Fool's Errand" at 95 points will do their duty no matter the cost. The Terran Vigils Regiment was raised on –DELETED- on Terra by order of the High Lords of Terra to support the efforts of the Ordo Vigilus. Unlike other regiments, the Terran Vigils is not numbered and does not answer to the Ordo Tempestus; the Ordo merely (and grudgingly) provides equipment and reinforcements. Headquartered on Terra and garrisoned throughout Segmentum Solar, the regiment acts as the eyes, ears and fist of the High Lords of Terra, often in conjunction with the Ordo Vigilus whose task it is to find and destroy political sedition. Uniquely, when not on training or operations, the Scions of the Regiment are left to their own devices with no support and little pay on the planets they are garrisoned; the goal of this being that the troops will live off the land and, therefore, tap the wealth of intelligence that can come from the common people . The unit’s symbol is an ancient Terran symbol of observation. Commisar Carlos Vokes: Born – DELETED- on Terra to parents of middling prosperity involved in Navigator's Guild trade; subsequently orphaned during a trade war where he lost an eye. Attended Schola Progenium Arcadia, where, noted for his tactical acumen and pragmatism, he was selected for training as a Commissar . Following graduation, he was attached to the Terran Vigils Regiment and has taken part in operations within the Sol System on behalf of –DELETED- resulting in the death of a number of possible insurrectionists. Presently, has been ordered by -DELETED- to proceed to Ioria and investigate, and if necessary eliminate, the political leadership of the planet in light of recent events. Maximillian, your request for additional resources for your platoon has been approved. We will be receiving an additional Taurox Prime for the upcoming campaign. Be sure to prepare to equip the vehicle with all weapon load outs as we approach the planet; further, we will likely receive additional reinforcement at a later date. Why couldn't have this started 3 days earlier when my Mordians were still in primer! I, ALTIS, hereby pledge the forces of THE CONCLAVE OF THE EMPERORS HOLY LIGHT under LORD INQUISITOR CALLAS to the capture of Ioria in the name of the Emperor. The contribution of Ordo Xenos Inquisitor Yevin at 112pts will do their duty no matter the cost. Only having recently been inducted as a full inquisitor by Lord Callas himself, Inquisitor Yevin is seen by many within the Inquisition as nothing more than an errand boy or puppet of Callas. Yevin's trust in his former mentor is absolute and unquestioning, a trust which often sees him called upon to provide fire support to the Lord Inquisitor despite not knowing the reasons. Nevertheless, Yevin's faith and willingness to please Callas has seen him take a more active interest in the Mechanicum, and now sports full powered armour with conversion beamer attached. He has also begun to travel in the company of heavy gun servitors, so that he might dispense the Emperors' Holy Light upon the foul xenos and heretic all the more readily. Regarding Lord Inquisitor Callas, there is less information. For the past 50 years this enigmatic agent of the Imperium has led the Conclave of the Emperors Holy Light, a loose conglomeration of inquisitors of various ordos within Segmentum Tempestus, with the common goal of sharing information and resources against the threats that face the segmentum. Recently however Callas has become more secretive in both his actions and whereabouts, leading some within the conclave questioning his true motives and endgame. One such inquisitor, Lord Safrax, openly accused Callas of abusing his position to further his own political agenda on Terra at the last conclave meeting and it ended abruptly with Safrax storming from the auditorium. Although there have been communiques from Safrax since that day apologising for his behaviour and accusations, no one has actually seen the inquisitor. Sorry about this WarriorFish, just a couple of more questions. I've ordered the starter Tempestus box for this campaign, would I be right in that I could pledge a 5 man squad in Jan, a command squad in Feb and the commissar in march ? Also do I write up the fluff for all of them before hand or add to it as each new pledge is vowed ? Thanks in advance. Can i pledge more for this month? Can i just edit my post with a larger pledge? Or do a 2nd pledge when i finish the first? The "before" pict of my Magos. Quick question here: Only a single unit per vow, no problem. But what about ICs? Can I vow a squad of guardsmen and a Commissar? Or a CCS with an attached Inquisitor? Oh and would, say an Infantry Platoon be a "unit" for these vows? I, GKTerminator, hereby pledge the forces of the First Firestorm Sentinels under Commander Edric "Ashborn" Shade to the capture of Ioria in the name of the Emperor. The contribution of one Veteran squad and their attached Chimera Transport at 207pts will do their duty no matter the cost. 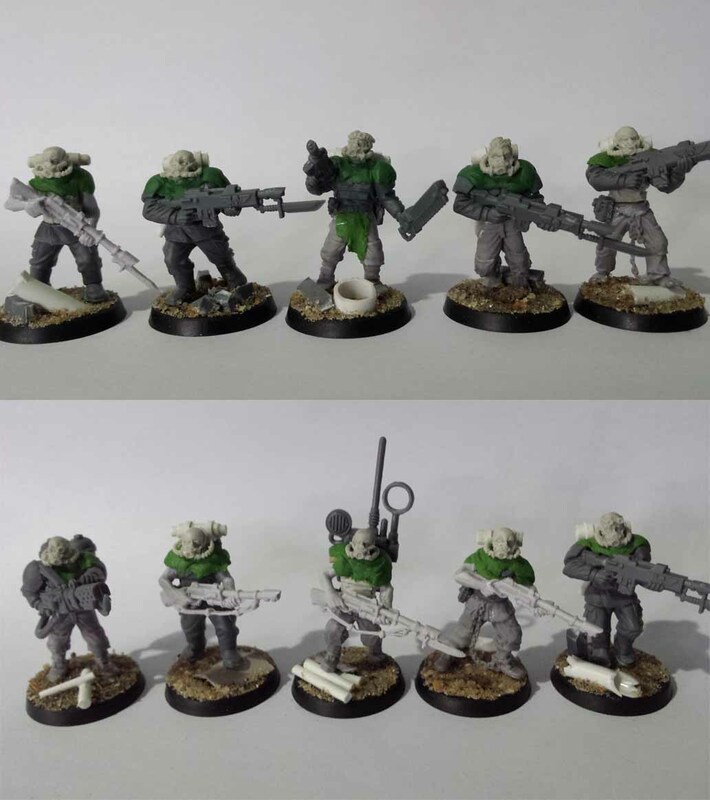 10 Veterans (Forward Sentries doctrine) under the command of Sergeant Adema (powerfist and bolt pistol), this unit is know to carry 3 crack snipers and a mortar team to lend fire from concealed locations. They tend to travel quickly by Chimera, one equipped with two heavy bolters, a dozer blade, camo netting extra armour, and recovery gear. I paint while I build, so these guys are in the box but will be requisitioned and kitted out! Edited by GKTerminator, 04 January 2017 - 07:32 AM.